If you still enjoy or remember Christmas in the Big City these days from the distance of Door County, you recall neighborhoods and suburbs coming alive again in sparkling new light. Or you look back with fondness and nostalgia as I do to Chicago Christmases of store windows aglow along State Street, “Merry Christmas” on everyone’s lips…an unusual comfort and love upon the sometimes mean, gray streets…and maybe a slow walk along Michigan Ave. in a soft snow, breathing it all in…the beauty of a city so alive, burning bright. 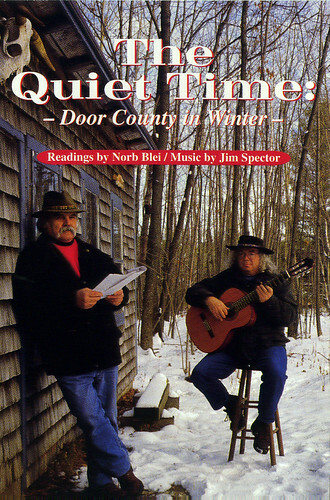 But there is something to be said as well for Christmas in slow motion…Christmas in the rural, in the small towns and villages of Door County, each one bringing its own small gift of Christmas cheer—white lights, wreaths, a large tree, the live goats on the roof of Al Johnson replaced by lighted reindeer. Much for neighbors, friends, strangers to take in, appreciate in small measure while, passing through. A homemade Christmas. 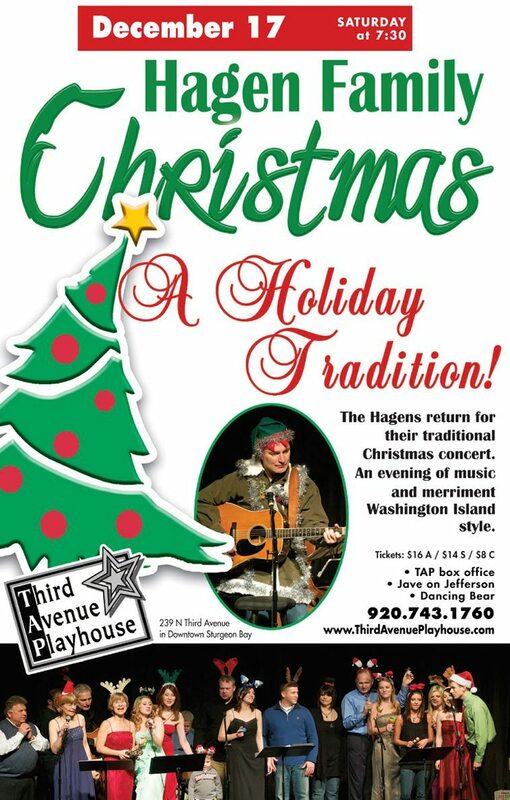 And while we don’t have the big concert halls and opera houses where city people flock to hear wonderful choirs and Christmas theater productions…we do have the Third Ave Playhouse in Downtown Sturgeon Bay, where every Christmas we get to enjoy a Washington Island family of singers and musicians–the Hagen Family Christmas concert, a holiday tradition for about thirteen years now. Multi-talented (singer, songwriter, musician, humorist, storyteller, somewhat ‘middle-aged’, heart-and-soul Islander to his very bones), Julian Hagen sort of heads the family these days, since his father, Jack’s passing a few years ago. Old Jack was a wonder to behold upon the stage. A great storyteller. A singer who could yodel too. Though the county at this point continues to offer some of the best music of all kinds and some of the finest musicians, singers and songwriters, Julian is probably our one and only, authentic Door County. He knows the territory. Talks the talk. Walks the walk, Writes and sings songs that hum down home. I recall a Hagen family story he sometimes tells when a new member of the Hagen family is born…how the doctor slaps the baby…and if the baby does not let out a cry, a song…it’s tossed aside. Not a real Hagen. He said “Easy now, don’t be afraid. Born is the Savior of men. Readers one and all, in Door County, out of Door County…consider being put on notice: Christmas doesn’t officially arrive in the county till the Hagens sing. Saturday night, December 17th, 7:30, the Third Avenue Playhouse. “An evening of music and merriment” reads the poster.